At a time when the industry leaders (according to Gartner and Forrester) are heavy in debt and suffering revenue loss, we have a profitable challenger who is growing revenue at an annual rate of 23%. SPS Commerce will come in just under $40MM in revenue for 2009. The stated uses of the proceeds are to pay down debt and invest in short-to-medium term investments till acquisition opportunities present themselves. It sounds to me like industry consolidation beckons. So I spoke with Archie Black, SPS CEO, today and for the first time got a "no comment" reply due to the limitations imposed by the SEC. Being a shareholder, I spent the day looking at other publicly traded SaaS companies and comparing it to the SEC documents released by SPS. 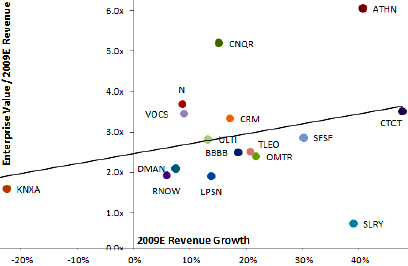 I looked at revenue growth, bottom line, P/E ratios and enterprise valuation to get an idea of what to expect from SPS. My guess is $105MM IPO valuation which is roughly 2.75x TTM (trailing twelve months) revenue. What's your estimate? NEW YORK, April 21 (Reuters) - Software company SPS Commerce Inc priced shares in its initial public offering at the midpoint of the expected range on Wednesday and sold more shares than anticipated, according to an underwriter. The company sold 4.96 million shares for $12 each, raising about $59.5 million. It had planned to sell 3.33 million shares for $11 to $13 each. The shares will begin trading on the NASDAQ Global Market on April 22, 2010 under the ticker symbol "SPSC." Well it looks like I was not too far off. SPS is going public this week (Thurs or Fri), they cut down the offering to $26MM from $46MM. The target price of the offering is $11-13/share. At $11 the SPS Valuation is $120MM which is ~ 3x TTM (twelve month trailing revenue).